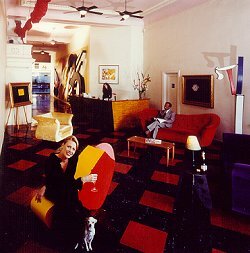 The Gershwin Hotel made its debut in 1993 as New York's first upscale budget designer hotel. Long known as "the place to stay" for up and coming artists, writers, and creative spirits from all over the world, The Gershwin offers affordable and eclectic lodging in the heart of New York City. All 132 private rooms are fully furnished with private bathrooms, television and telephone. Fax and E-mail services are available via the Front Desk. There is also live entertainment in the Living Room and the Gershwin Floors showcases famous and up and coming artists. This and other New York Bed and Breakfast Inns can be found here in The Register.